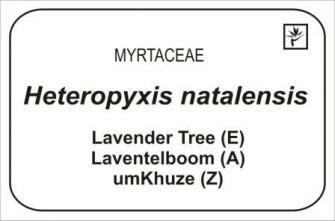 Plant labels in botanical gardens have traditionally been limited to the scientific name, family name, common names and distribution. While this is valuable information, most visitors to gardens find it difficult to relate to these often unfamiliar words. They may find the plants, and their often fascinating stories, somewhat inaccessible. Since a major function of many of our gardens in Africa is an educational one, it is necessary to look for ways in which plants and their stories can be made more accessible to more visitors. After discussions with interpretation staff at the Alice Springs Desert Park in Australia, the former NBI (now SANBI) began experimenting with various plant label designs, which were more interpretive than traditional botanical garden labels. 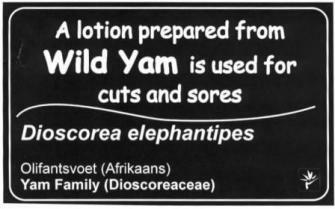 Many of Africa’s plants are in danger of disappearing from their natural habitats, and in some cases are in danger of extinction. 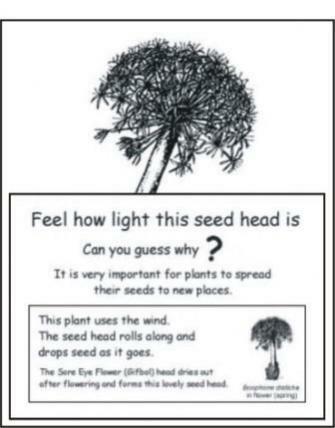 Simple nature interpretation techniques can be used to heighten awareness of these problems and to advise garden visitors on how to help save these plants. 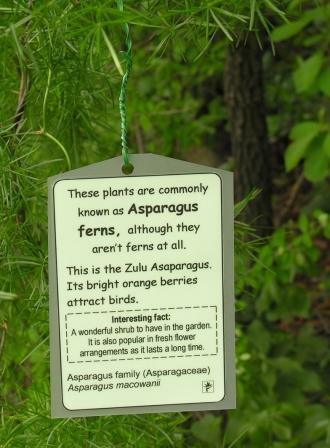 The use of small, temporary plant labels for interpretation has many applications and is employed in all of SANBI’s national botanical gardens.